The Food and Drug Administration is cracking down on over 500 online pharmacies that illegally sell potentially dangerous, unapproved versions of prescription drugs, including opioid pain medication, antibiotics and injectable epinephrine products. So far the crackdown doesn’t appear to be very effective, as many of the websites the FDA targeted remain online. The FDA recently partnered with Interpol and other international law enforcement agencies in a global operation called Pangea X. The goal was to identify the makers and distributors of illegal prescription drugs and shut them down. “These rogue online pharmacies are often run by sophisticated criminal networks that knowingly and unlawfully distribute illicit drugs, including counterfeit medicines and controlled substances. Consumers go to these websites believing that they are buying safe and effective medications, but they are being deceived and put at risk,” FDA Commissioner Scott Gottlieb, MD, said in a statement. The FDA sent 13 warning letters to the operators of 401 websites informing them they were illegally selling unapproved prescription drugs. One such letter went to the American Pharmacy Group in Silver Spring, Maryland, warning the company about selling an unapproved combination of hydrocodone and acetaminophen in 10/500mg doses. The FDA asked drug manufacturers in 2011 to limit the strength of acetaminophen in prescription drugs to 325mg because of the risk of severe liver injury. The FDA letter was dated September 19, 2017. But today a website affiliated with American Pharmacy Group was still selling the hydrocodone/acetaminophen combination in the 10/500mg dose as a “muscle relaxant.” A bottle of 30 pills could be purchased for $269 with 2-5 day delivery. 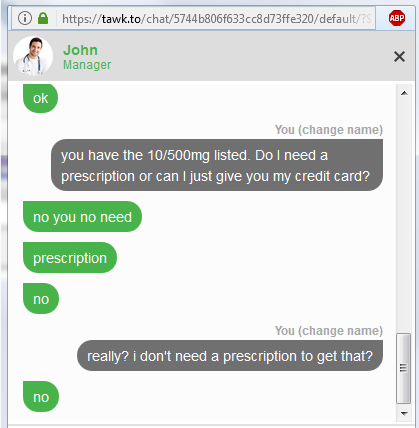 In an online chat with “John” the pharmacy manager, I asked if a prescription was needed to get the painkiller. “No you no need prescription no,” was his reply. John then referred me to a “new” online pharmacy, one that was not on the list of 21 websites the FDA identified as being affiliated with American Pharmacy. It’s apparently easier to put a new website up than it is for federal agents to take an old one down. In adddition to warning letters, the FDA seized nearly 100 website domain names, such as buyhydrocodoneonline.com, canadian-pharmacy24x7.com and buyklonopin.com. As part of Pangea X, FDA inspectors also screened packages suspected of containing illegal drugs at international mail facilities (IMFs) in Chicago, Miami and New York. Those screenings resulted in nearly 500 parcels being seized. “Our work to fight illegal online pharmacies is not over,” said Gottlieb. "We’ve recently tripled the staff we have in the IMFs to improve our ability to inspect packages that are suspected of containing illegal drugs, and we have doubled the number of cybercrime and port of entry special agents for the Office of Criminal Investigations,” Gottlieb said. Interpol said it seized over $51 million in illicit and counterfeit medications during Operation Pangea X. Over 400 people were arrested worldwide, with 3,584 websites shut down.